The trim of a sliding gate valve essentially consists of a fixed disc and a movable plate installed directly in the flow path. The disc and plate have precisely located and sized perforations, slots, or other openings. 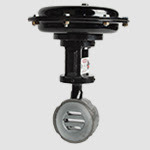 The valve actuation mechanism slides the plate across the face of the disc, progressively changing the alignment of the openings in the plate and fixed disc. This type of design can bring some benefits to the process and user.